After my review of the previous “Rare Book Mystery” (Left Turn at Paradise), I thought that the series had promise, but I had never connected with the main character. I was eager to give the series another shot, and am glad that I did. The Widow’s Son, by Thomas Shawver, continues the exploits of book dealer, Michael Bevan as he works to become accepted among the elite rare book dealers. To do so, he must come by an extremely rare book acquisition, and come by it through diligence and hard work (and not simply have it given to him). Bevan thinks he may have scored just such a book — a first edition of The Book of Mormon inscribed by one of the leaders of the first church. But that inscription hints at something nefarious and despite the century and a half that has passed, there still seems to be some dark secrets at work among a sect of the Mormons. A dark secret that could mean death to a dear friend. Everything about this book works quite well. The set-up with the rare book and Bevan’s desires to be recognized among the elite dealers is clear and the obstacles in his path are mighty but workable. The crossing of stories (the book dealing and the Mormon mystery) comes about very naturally and I had no problem buying in to both stories. I was easily caught up in the stories, following them carefully. But what works best, for me, is the development of Bevan’s character. This story is about Michael Bevan, after all, and, as I saw with the previous book, if I am not invested in the character then I don’t care whether the character meets his goal or not. But this Bevan is strongly motivated and appropriately contrite (when he needs to be). He is driven, in both his desire to have his business succeed, and also in solving the mystery. I also appreciated the history here. I know little-to-nothing about Mormons or the Church of Latter-Day Saints, but I get the sense that Shawver has rooted his story in some history that is fact-based. And oddly enough, I recently read another mystery wherein the Mormons played a part. There were times when Michael Bevan still came across rather callous and uncaring. Perhaps this is an intended trait, there are certainly people like this, but it still put up a wall for me, keeping me from being completely behind the character. A good read and I look forward to more and to see how Bevan’s book-selling life develops. Looking for a good book? 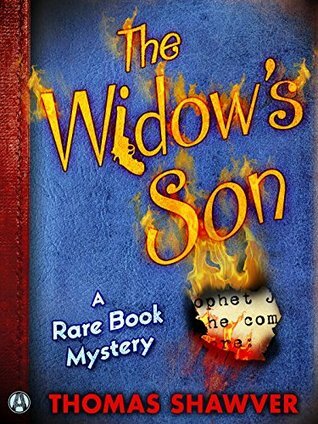 A “Rare Book Mystery” should appeal to any book reader and mystery lover, and Thomas Shawver’s The Widow’s Son definitely will appeal. I received a digital edition of this book from the publisher, through Netgalley, in exchange for an honest review.